Home » The Garter. Orders of Knighthood. OF the various Orders of Knighthood which originated in the chivalrous feelings of the Middle Ages, few have continued to hold so high a rank as that of the Garter, founded originally by one of the most warlike of the English monarchs, and numbering among its members the greatest names which have figured in history during several centuries. 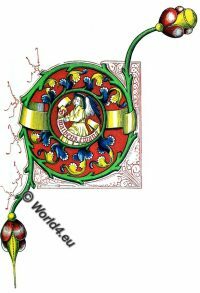 Mr. Beltz, in his valuable “Memorials of the Order of the Garter,” appears to have established on substantial grounds the fact, that the Order of the Garter was founded by King Edward III. in the year 1344, on the occasion of solemn festivities held by that monarch in the castle of Windsor. The popular story, by which the adoption of so singular an emblem as a blue garter has been commonly explained, namely, that at a ball given by that monarch, the fair countess of Salisbury, to whom he was paying his addresses, had dropped her garter on the floor, and that the monarch took it up and offered it to her, observing, in answer to the smiles of his courtiers and in the language then used, Honi soit qui mal y pense (the expression which has since been adopted as the device of the order), appears to have no good support in history. It may be observed, that among the first members of the order were the Black Prince and many of the heroes of the French wars. The patron of the order was St. George, as being also the patron of England. 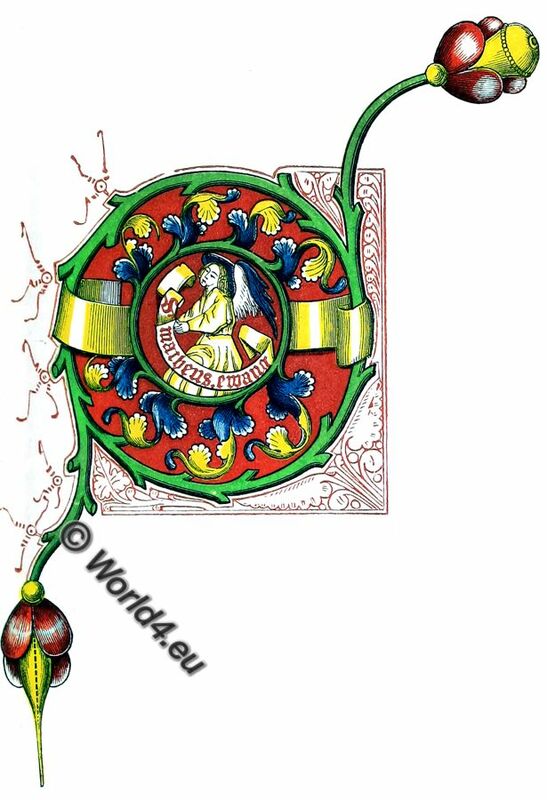 In another part of the present work we have an illumination representing the principal sovereigns of Europe, as Knights of the Garter, bowing before the altar of that saint. 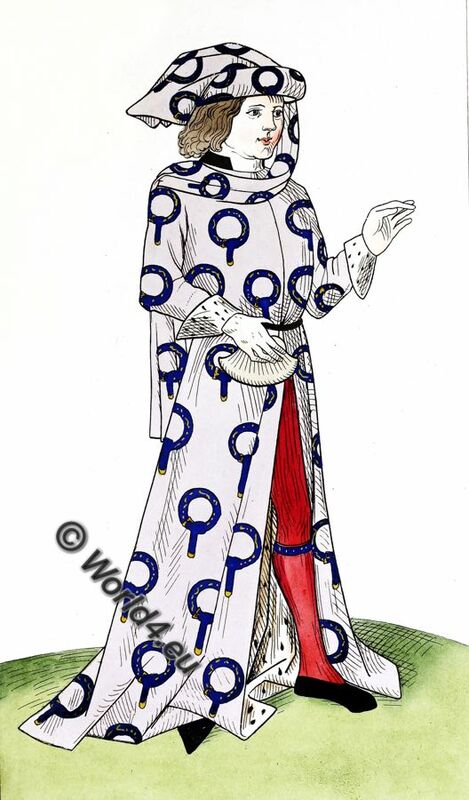 The accompanying plate represents the dress of a Knight of the Garter about the time of Edward IV. or Richard III., and is taken from a paper manuscript of that date in the possession of Thomas Williment, Esq. This manuscript appears to have been written in England, for a Pole or Russian, and on one of its leaves is the inscription, Vincislai et amicorum; it contains a treatise on heraldry, and a copy of that set of the statutes of the order which stands as second among those printed in the Appendix to Ashmole’s large work on this subject. 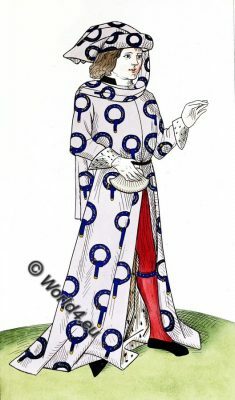 Since the first foundation of the order, various slight alterations have been made in the costume; in the first instance it consisted of a mantle of woolen cloth ( the staple manufacture of this country), of a blue ground, lined with scarlet cloth; the garters of blue cloth or silk, embroidered with gold, having on them the motto of the order in letters of gold, and the buckles, bars, and pendants of silver gilt; of a surcoat, also of woolen cloth, narrower and shorter than the mantle, and fastened to the body by a girdle the color to be changed every year; and of a hood made of the same materials as the surcoat. The initial letter on the preceding page is taken from a fine early printed edition of the Commentary of Thomas d’Aquinas on the Gospels; it is hardly necessary to say, that the figure within the letter represents one of the Evangelists. 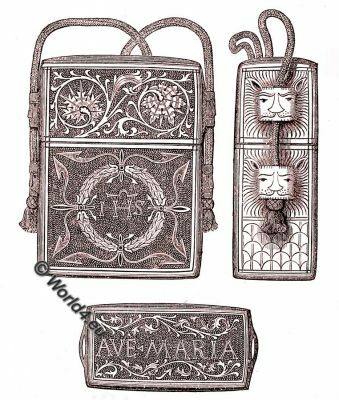 The wood-cut below represents a case for a book, of leather, of the 15th century, purchased at Venice, by the Honorable Robert Curzon, junior.